India’s relations with the South American region are mostly dominated by its partnership with its BRICS co-partner, i.e. Brazil. Consequently, relations with Argentina, the second-largest country in that region, have usually been eclipsed for a long time, highlighted by the fact that PM Modi’s state visit to Buenos Aires took place after a gap of 23 years whereas BRICS leadership meets annually. 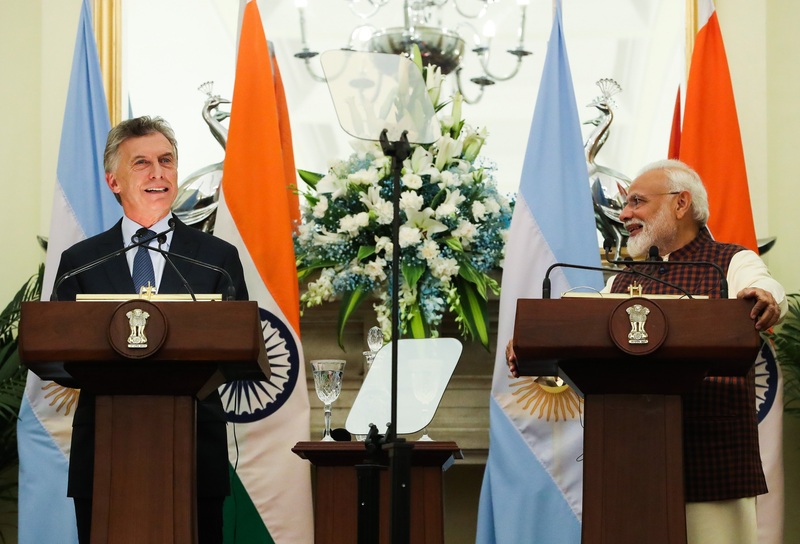 A state-level visit to India by the Argentine President Mauricio Macri from 17 to 19 February 2019 brought in to focus and highlighted the growing ties between the two nations. Indian PM Modi had earlier visited Argentina in November-December 2018 to attend the G20 Leaders Summit. The visit assumes heightened significance as part of the celebrations of the 70th anniversary of the establishment of diplomatic relations the Argentine Republic and the Republic of India. India and Argentina share mutual values of democracy, freedom, the rule of law, respect for human rights and territorial integrity of states. The political ties are being reinforced as The visit saw the two leaders reaffirming their strong commitment to further strengthen and reinvigorate the multifaceted relations by elevating it to a strategic partnership with a focus on key areas of mutual advantage. It is in this context that an MoU in Defence Cooperation was signed between the two sides. Further, the two leaders noted the operationalization of the Framework Agreement on Cooperation on the Peaceful Uses of Outer Space, which would aide space collaboration including in areas such as Satellite Remote Sensing, data sharing, satellite building, and launch. In the field of nuclear cooperation, an Argentine company INVAP is building a molybdenum plant named the Fission Molly Project in Mumbai (due to being completed by 2020), as part of the Agreement on Cooperation in the Peaceful Uses of Nuclear Energy signed in 2010. To further boost institutional linkages, an MoU was also signed between the Department of Atomic Energy, India and National Atomic Energy Commission, Argentina for cooperation within the framework of Global Center for Nuclear Energy Partnership. Argentina has an expertise in building small-capacity reactors and is keen to work with India in third countries in tripartite projects. Visiting just days after the horrific Pulwama attack, the Argentine President showed great sensitivity on Indian concerns regarding terrorism. This was highlighted when the two leaders issued a separate Joint Declaration emphasising the need to firmly and unequivocally fight the menace of terrorism. In the economic sphere, the bilateral trade between the two countries at present is at around US$3 billion with increasing potential for further growth. President Macri is seen as a pro-reform and business oriented person who is keen to further grow Argentina’s economic footprint around the world. Under his administration, the Argentine economy is being liberalized by steps such as lifting capital controls, floating the currency Peso and removing export controls on some commodities, etc. He was accompanied by over 100 businessmen on his visit which again shows the importance being given to the growing consumer market of India. The visiting president stressed that the relationship is based on complementarity, where the Latin American nation can help with food and energy resources for India’s large population. He added, hence, that “We see India as a partner for the future”. Since 2014 India has been included in Annex 2 list of countries that allow the introduction of Indian pharmaceutical drugs in the Argentine market. India already has a PTA (Preferential Trade Agreement) with Mercosur (bloc consisting of Brazil, Argentina, Uruguay, and Paraguay) and efforts are being made to further expand the trade pact. Indian companies such as IT giant TCS, automaker Bajaj Auto, pharma company Glenmark and consumer goods company Godrej are active and investing in Argentina, thereby, taking advantage of the pact to further enlarge their footprint in Latin America. One essential key area of mutual complementarity is food security. Argentina’s rich fertile plains of the Pampas region are one of the most fertile in the world. With a population of roughly 44 million only, Argentina has a lot of surplus food production available for export. India on the other hand with its burgeoning population and stagnant food production is looking for imports for its food security. In this regard, President Macri said, “The demographic and economic growth of India along with Argentina’s capacity to produce food makes us complement each other”. Argentina ranks first in soy oil and soy meat as a world exporter. Argentina’s share of India’s food and beverage imports basket stands at 7.8% (as of 2017 figures) and is set to further increase in the future. PM Modi aptly called Argentina a powerhouse of agriculture and added that India sees it as a partner for food security. In the renewable energy sector, Argentina became the 72nd country to sign the Framework Agreement of the International Solar Alliance (ISA). Argentina on its side invited Indian companies to participate in its RenoAR renewable energy program. The two sides identified the mining sector as another sector with immense potential. Argentina has the third largest reserves of Lithium in the world which is crucial for battery technologies. The Argentine side conveyed its satisfaction with the formation and initiatives taken by Khanij Videsh India Limited (Kabil), in exploring opportunities in developing lithium assets in the Latin American nation. This would help India in its desire to achieve the target of 175 GW power generation from renewable energy sources by 2022 under its pledge in the UN Framework Convention on Climate Change and objective to have at least 30% of its vehicles run on electrical batteries by 2030. The Argentine side further expressed its readiness to share geological exploration expertise for lithium deposits. Argentina is looking for investment in its Shale oil and gas exploration ventures and is keen to partner with India in this regard too. South-South Cooperation is a term historically used by policymakers and academics to describe the exchange of resources, technology, and knowledge between developing countries, also known as countries of the Global South, the idea for which took shape at the Asian-African Conference in 1955 at Bandung, Indonesia (also called Bandung Conference). In 1978, the United Nations formally established the Unit for South-South Cooperation to promote South-South trade and collaboration within its agencies. As part of this South-South cooperation, India and Argentina support each other’s candidature at various multilateral forums. Both countries reaffirmed their commitment to globalization and reformed multilateralism and emphasized the essential role of the UN in maintaining global peace and security, promoting economic and social advancement and dealing with global threats and challenges. They further reiterated their commitment to intensify their dialogue in the United Nations and other multilateral organizations to address current global challenges such as climate change and to foster international and regional peace and security, as well as sustainable development. Both sides agreed to cooperate and work together in multilateral fora and promote the interests of developing countries. They also stressed on the need to comprehensively reform the UN Security Council to reflect the 21st-century realities and strengthen the rules-based, open, transparent, inclusive, non-discriminatory and equitable multilateral trading system with the World Trade Organization at its center. To further boost people-to-people, cultural ties and give a fillip to tourism, the Argentine side has included Indian citizens in the e-Visa system and both sides signed an MOU on Cooperation in the field of Tourism to further boost ties. Lack of connectivity and distance impede these initiatives somewhat. In this regard, it is important for both sides to conclude an Air Services Agreement at the earliest. Yoga and Bollywood are immensely popular in Argentina and so is the fan-following of Argentine football stars in India. These are acting as bridges as PM Modi said at a Yoga event in Buenos Aires last year, “yoga is bridging the vast distance between Argentina and India, and connecting their people.” There needs to be more interaction between the student, academics and scientific communities also on a regular basis. To advance and expand ties, other areas are being explored and included such as e-Governance, e-health, digital payment infrastructure, financial inclusion, Artificial Intelligence, and machine learning, cultural collaboration, cooperation in the Antarctic and enabling services professionals by negotiating a social security agreement. To conclude, the ties between the geographically distant partners are on an upswing with bright prospects for the future. There is a lot of natural complementarity between the two countries which can be leveraged further to expand cooperation in the ever-widening range of sectors. The momentum is highlighted by the push from the top political authorities which have met on five occasions in the last three years. With India’s economic rise and its burgeoning middle-class consumer market hungry for energy, goods and food products, the importance of hitherto overlooked crucial countries like Argentina that are opening up to the world would grow rapidly. It is a partnership for the future indeed and would be one of India’s major foreign policy priorities in decades to come.